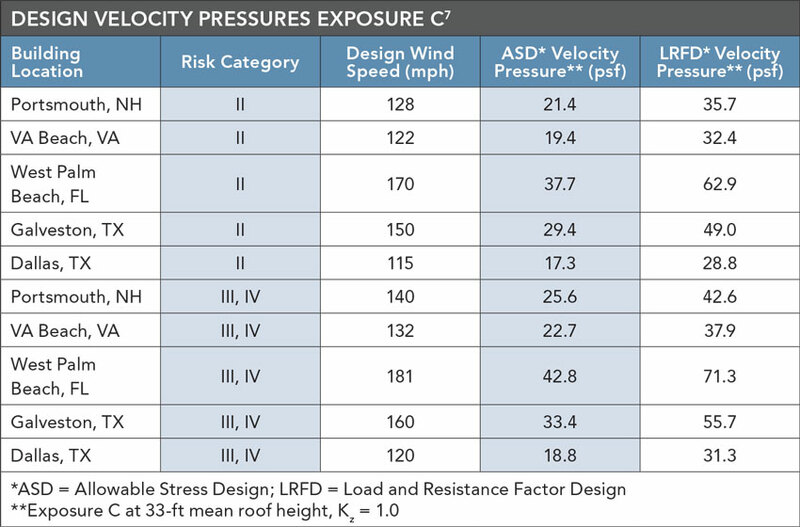 One of the basic decisions in the design of wind-resistive buildings is determination of exposure category based on the roughness of nearby terrain. For each wind direction considered, an exposure category that reflects the characteristics of terrain surface irregularities must be determined for the site at which the building or structure is to be constructed. The concept of exposure categories provides a means by which to define the relative roughness of the boundary layer. The land or water surface adjacent to the building site exerts a drag force on wind due to obstructions that retard the flow of air close to the surface. The reduction in the flow of air is a function of height above the terrain surface and terrain roughness. Wind speeds increase with height above the terrain. The relationship between height above the water or ground and wind speed is exponential. The rate of increase in wind speeds with height is a function of the terrain features. The rougher the terrain, the shallower the slope of the wind speed profile. The smoother the terrain, the steeper the slope of the wind speed profile. ▶ Surface Roughness B. Urban and suburban areas, wooded areas or other terrain with numerous closely spaced obstructions having the size of single-family dwellings or larger. ▶ Surface Roughness C. Open terrain with scattered obstructions having heights generally less than 30 ft. This category includes flat open country and grasslands. ▶ Surface Roughness D. Flat, unobstructed areas and water surfaces. This category includes smooth mud flats, salt flats and unbroken ice. Categories are used to define this roughness in the boundary layer. The surface roughness within each 45-degree sector must be determined for a distance upwind of the site for the purpose of assigning an exposure category. Exposure B is the most common exposure category in the country. Therefore, Exposure B is often the default exposure category. 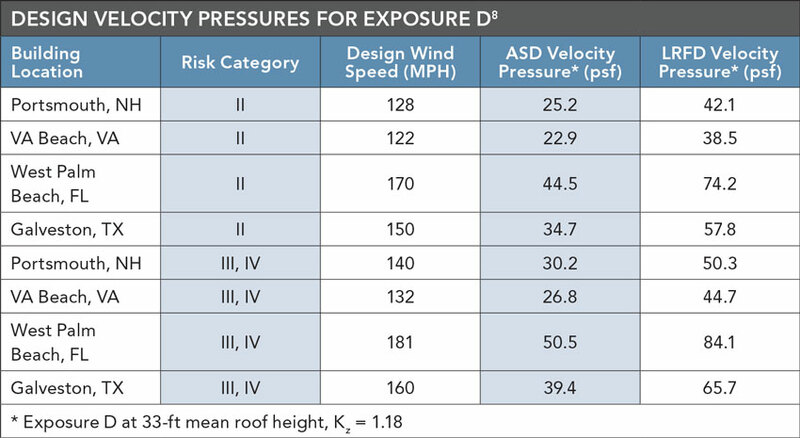 But it is important to recognize that exposure category varies based on conditions at the site and that buildings are often sited on properties of Exposure C and D with attendant higher wind loading. Over the past decade, there has been a significant philosophical change in exposure categories associated with shorelines in hurricane-prone regions. Historically, Exposure C was used along the hurricane-prone coastline, while Exposure D was limited to coastal Great Lakes and other areas where wave heights were assumed to be relatively small and inconsequential to wind flow. Wave heights in oceans and Gulf of Mexico waters are significant at the water's surface during a hurricane, thus producing substantial surface obstructions and friction which reduce the wind speed near the surface. However, recent wind research has indicated that surface turbulence from wave action lessens in open waters leeward of barrier islands and where mud flats, salt flats and other smooth land exists without high obstructions. So, Exposure D conditions have been greatly expanded in the latest editions of the IBC and ASCE 7 compared to previous versions. This has resulted in higher wind loading along much of the hurricane-prone coastlines.